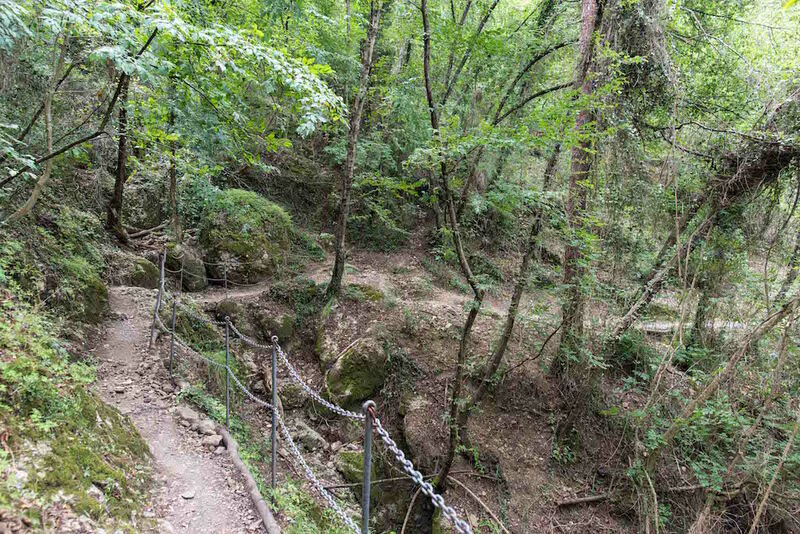 When we started planning our Italy trip about a year ago, my husband and I were both set on finding a fabulous day hike/trek. 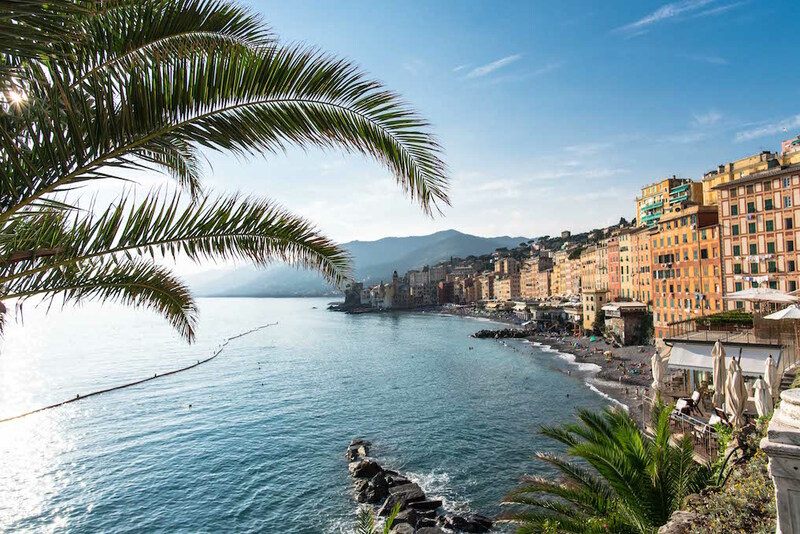 One day, I happened upon this Conde Nast Traveler article about one of the Italian Riviera’s best kept secrets, Camogli, a picturesque fishing village with hiking just steps away. 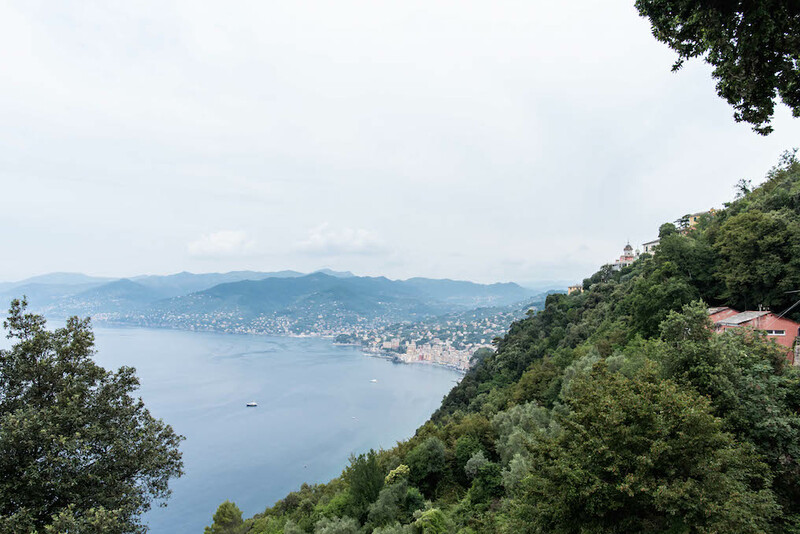 So we booked two nights at the Hotel Cenobio dei Dogi (more about the hotel here) and made plans to hike all the way to San Fruttuoso abbey and Camogli’s posh neighbor, Portofino. I read a number of blog posts and reviews about this trek, but found very differing opinions about the difficulty. Our experience fell somewhere in between the claims of being one slip away from “certain death” and it being a “pleasant” hike. Parts of it would be quite easy for most people and other parts are steep and strenuous (especially in the summer heat). 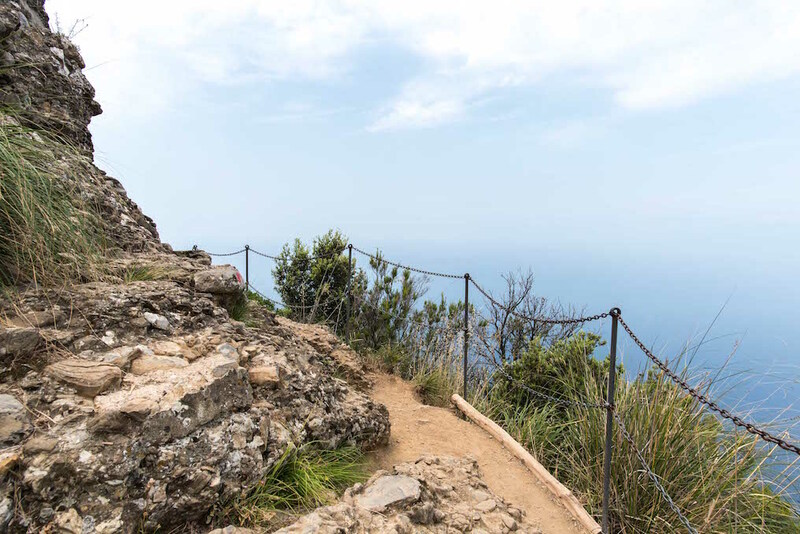 A few sections on the San Rocco to San Fruttuoso portion had chains to hold onto as you cross rock face, but none of them felt treacherous or scary. However, I don’t recommend taking the trails during or just after a heavy rain. There are frequent markings (two red dots) and signage that were recently updated throughout the trails, making it easy to stay on the path. It was everything we wanted in a hike: we virtually had the trail to ourselves (we passed only 6 other hikers in total), it was a great workout, and the views were nothing short of breathtaking. Here’s more info, a breakdown of each section that we traversed, as well as a video of the hike to give you a glimpse at the trails and gorgeous views. Backpack with water (at least 1L per person), snacks, sunscreen, money for lunch/return, and a camera! 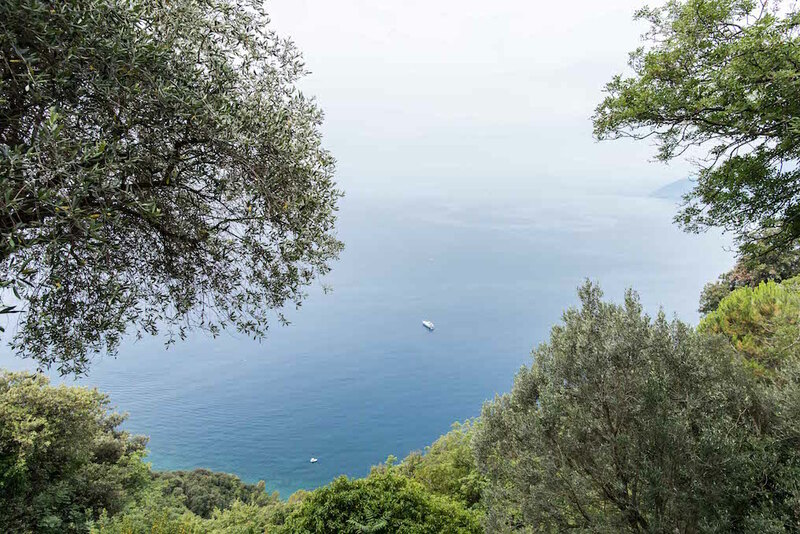 There’s a reward for making it up the seemingly endless stairs to San Rocco: views of Ligurian Sea and the coastline toward Genoa. There are a number of benches to sit for a rest or a snack. Depending on your timing, you can stop for a meal at Nonna Nina’s, grab treats at one of the bakeries, or peek inside the small church. 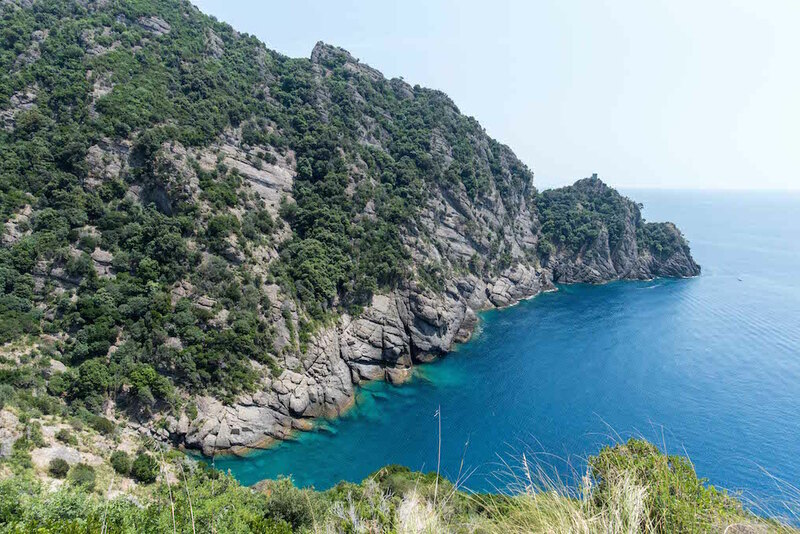 Impossibly blue waters meet an umbrella-lined pebble beach at San Fruttuoso. The 10th century former Catholic abbey (now a museum) in this cove is only accessible by foot or by boat. Pat yourself on the back for making it here the hard way. 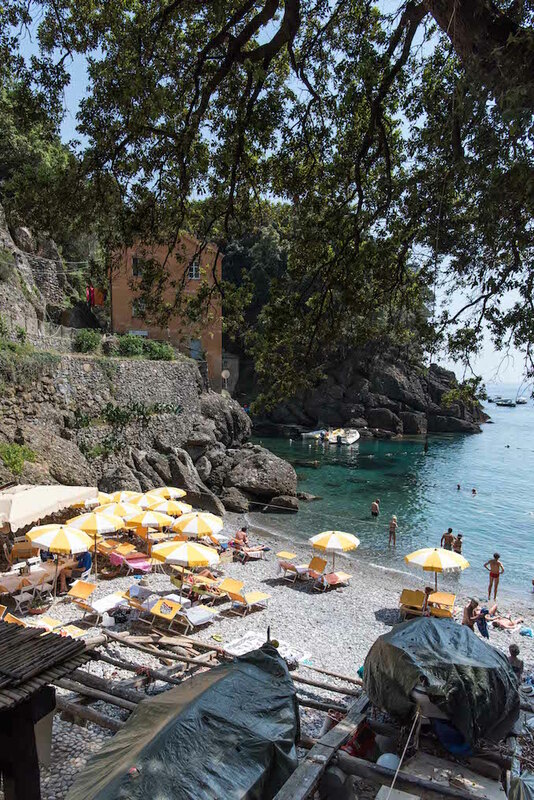 Five seasonal restaurants tucked into the beach and mountainside provide the opportunity to buy lunch or a well-deserved drink. 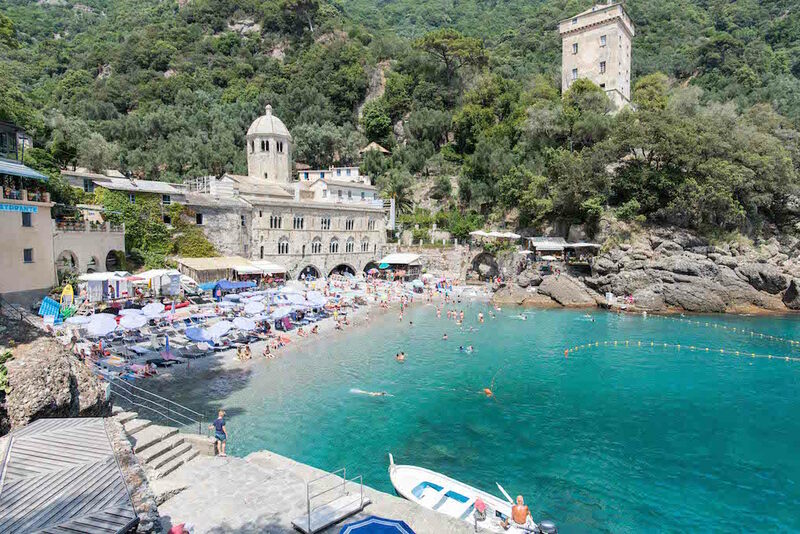 Rent sunbeds and umbrellas, swim in the cove, and/or tour the abbey and tower on your stop. 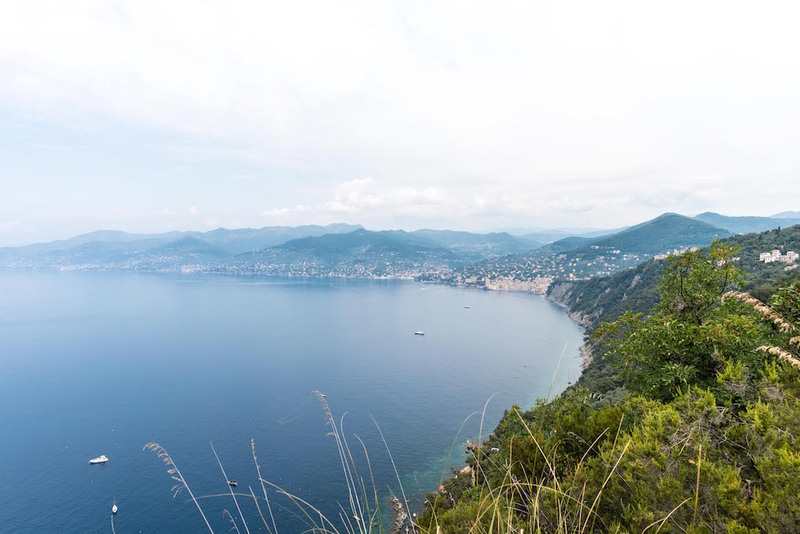 Take a ferry back to Camogli or continue on to Portofino. 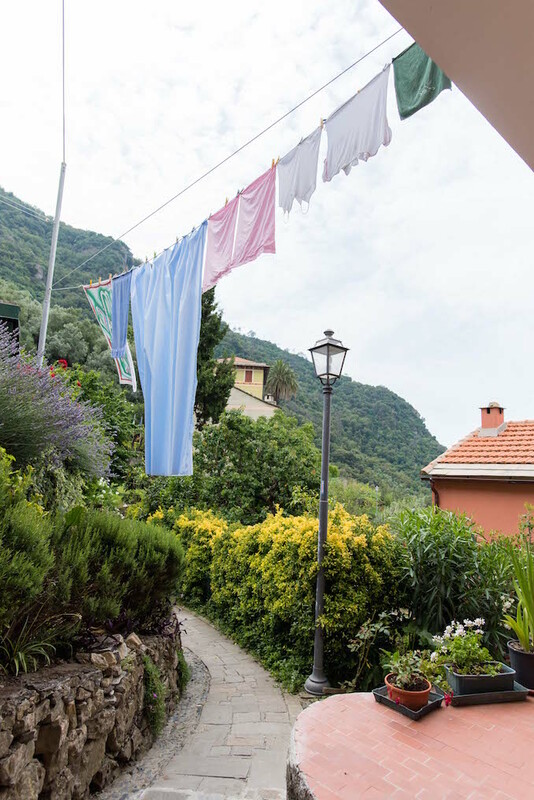 There are a few different paths into Portofino and the signs are slightly unclear about which is the fastest way (I’m fairly certain the one we chose was not). 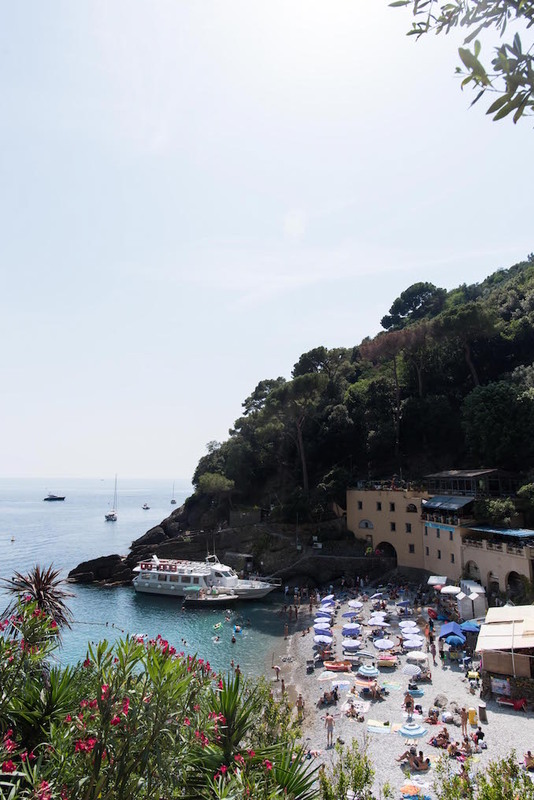 However, once you make it, the Portofino harbor really is like a postcard. The water is filled with wooden boats and yachts and the harbor is lined with high end shops, restaurants, gelaterias, and bars. Pause for photos, gelato (or granita! 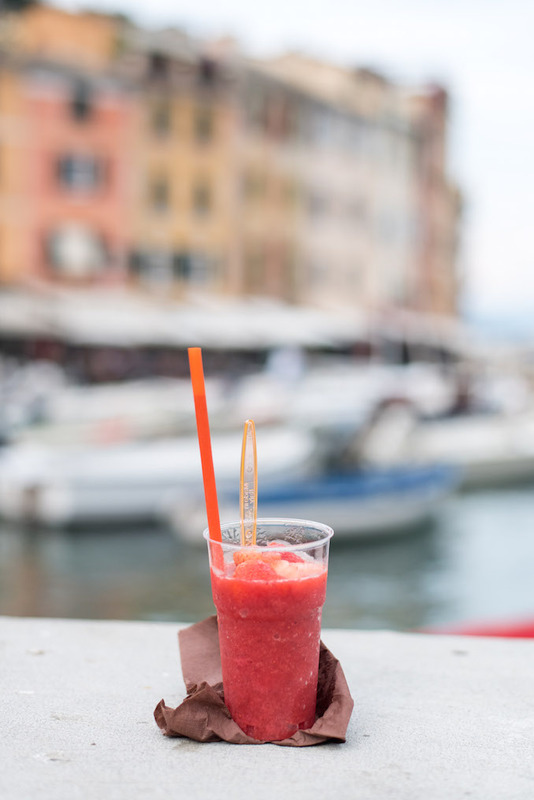 ), and a drink, but be sure to check the ferry schedules if you plan to take a boat back to Camogli. 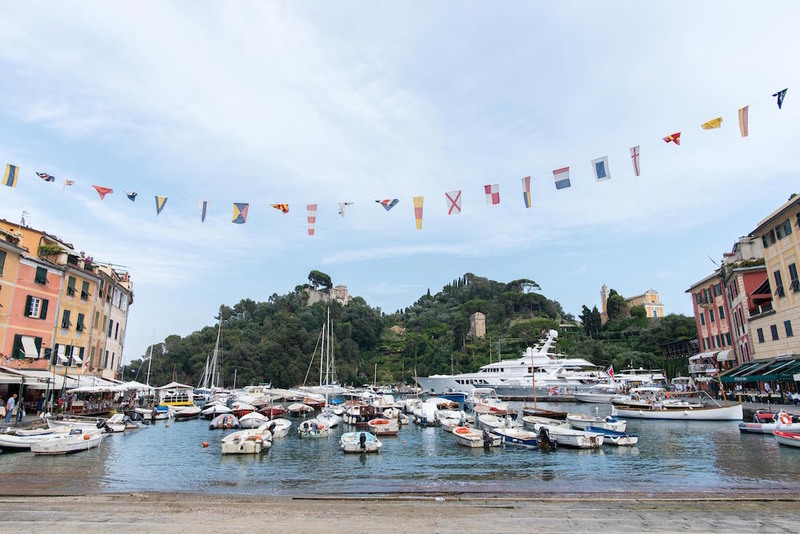 If you miss the last ferry (like we did), walk or take a taxi to Santa Margherita Ligure train station, where a quick hop on the train will get you back to where you started. 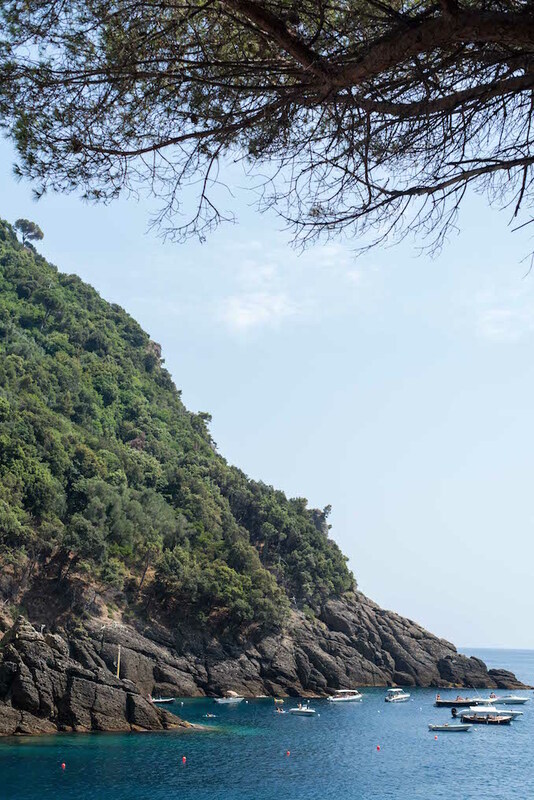 If time and energy allow, hike out onto the peninsula to the Church of San Giorgio, Castello Brown, and the Faro di Punta lighthouse. We hiked this trail in July 2016. Kenan, this looks fantastic! 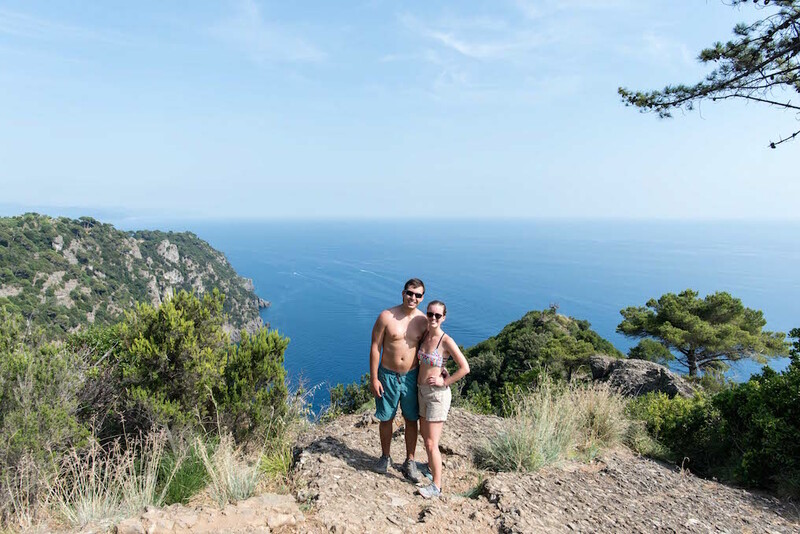 I love the photos, and I’m so jealous of your hike – it all looks amazing! Thanks so much, Liz! It was definitely one of my favorite hikes! That looks wonderful. Thank you so much. I am thinking of doing this trip next month with my two boys, 15 and 17. Do you have any other suggestions or comments that might be helpful? Frank, it is wonderful! We’re still talking about it 2 years later! I definitely recommend packing a lot of water. 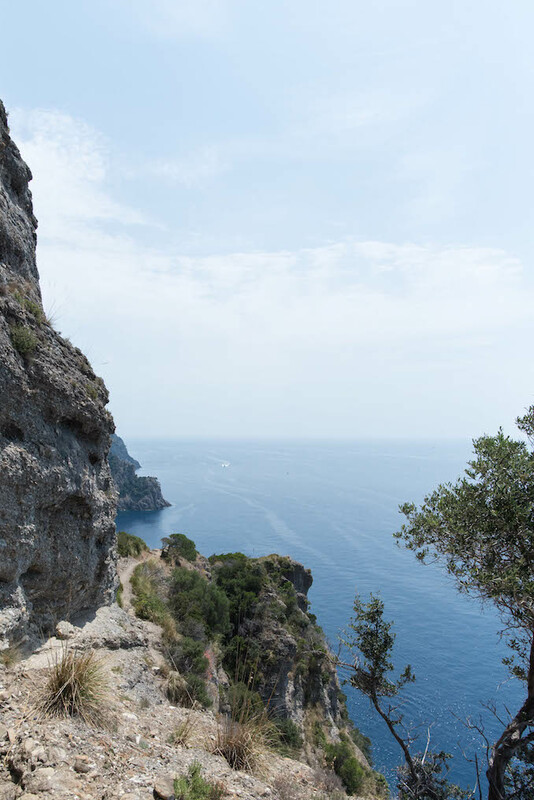 You can just do one leg of the hike and take a boat home, depending on how much you want to do (but check the boat schedules ahead of time so you don’t miss the last one like we did!) Have a great trip! Hi 🙂 Fantastic, thank you. 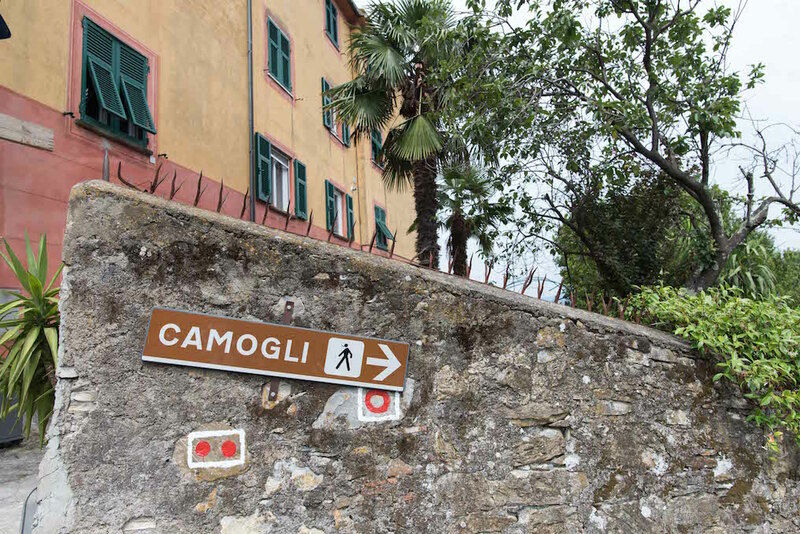 If one should take just one leg, which would you prefer – Camogli-SF, or Portofino-SF?